Composting is a frugal and environmentally friendly way to turn kitchen and garden waste into nutrient-rich fertilizer for your lawn, garden, or potted plants. Everyone can benefit from composting, whether you live in an urban apartment, a home with a yard, or on an organic farm like me. Photo: Kate, my sister-in-law, examines the massive compost bin her husband built. So stop holding your nose, save your kitchen scraps, and learn how to give a green thumb’s up for composting! I promise your nose won’t get out of joint with the sweet smell of soil success. Smile. I’ve got four really good reasons to start composting your kitchen (and garden) scraps today. Do you have more? 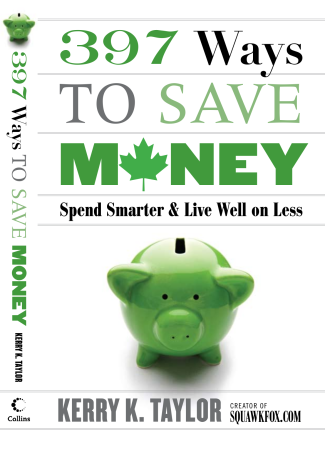 Composting reduces the amount of garbage you produce, which can decrease the cost of garbage pickup and save you from spending additional dollars on plastic garbage bags. Composting can eliminate the need to use synthetic fertilizer, saving you at least $20 to $50 per a year on gardening costs. You can decrease the amount of water you use in your garden (and save money) because composted fertilizer absorbs and retains water more readily than normal regular topsoil. Composting increases soil quality and can produce superior flowers and higher yielding vegetable gardens. All you need to create your own soil and reduce garbage waste is a compost bin, a kitchen compost bucket, and a shovel. A lumber wood or plastic compost bin for $0 to $100. A shovel or pitchfork to periodically turn the compost, around $20. 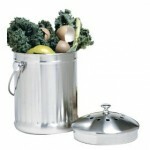 A kitchen compost bucket or a plastic container for $0 to $50. Composting bins can be built for little to no cost using scrap lumber, while plastic compost bins can be purchased at Amazon or at most hardware stores for around $60. 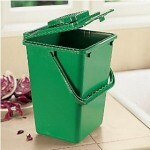 Your city or municipality may even sell plastic compost bins for half the price in the spring. Some gardeners prefer to stir their compost less often by using a compost tumbler. Here’s how to DIY and build a compost tumbler if you’re not into stirring a compost bin with a pitch fork. Kitchen compost buckets (or pails) conveniently store food scraps and eliminate odor before you transfer them to an outside compost. 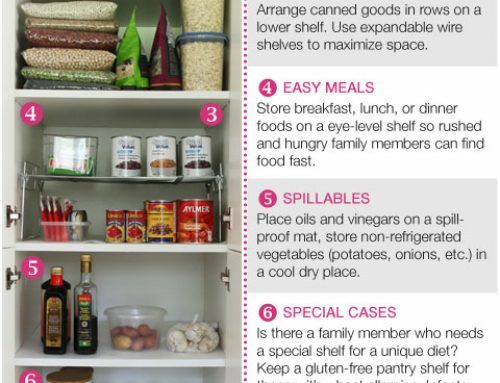 Many kitchen containers boast a tight-fitting lid, use long-lasting charcoal filters to eliminate odor, and are attractive options for above or below counter-top use. I’ve used two of these composting buckets over the years while living in an apartment and on the farm. They really do decrease smells and encourage a reduction in kitchen waste since I’m more likely compost kitchen scraps when the compost is easily accessible. Virtually all plant material can be composted, ranging from fruit and vegetable peels to coffee grounds and garden clippings. A well-maintained compost will break down smaller pieces of organic matter in weeks, giving you access to fresh soil on a regular basis. Inorganic materials, such as: plastic, glass, and metal. Fatty and oily foods like grease from a deep fat fryer. Poop (human or from your pets). Large pieces of wood – they’ll take forever to break down. Along with most plant, vegetable, fruit, garden, and lawn matter, here’s a list of compostables that may surprise you! 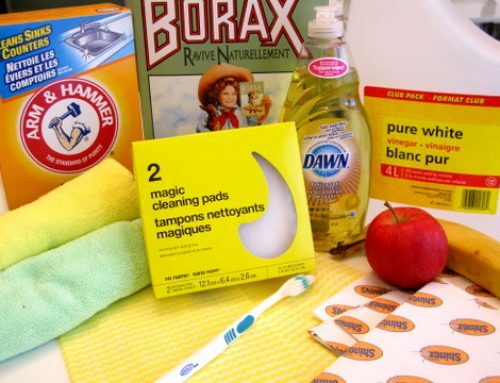 Paper products: paper towel, coffee filters, paper bags, news print, cardboard. It’s best to shred paper products if possible to speed breakdown. Even printed papers are safe to compost because most modern inks and dyes are vegetable based. Once you’ve got a compost bin, it’s time to start composting! Here are 4 easy steps to stink-free compost and some methods for building a more effective mixture. 1. Keep a small bucket or container near in your kitchen to help collect biodegradable scraps like produce peels and coffee grounds. 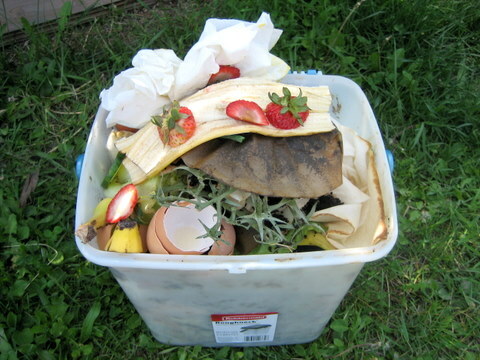 Every few days, dump your kitchen waste into the compost bin. 2. Mix the new material into the existing compost. 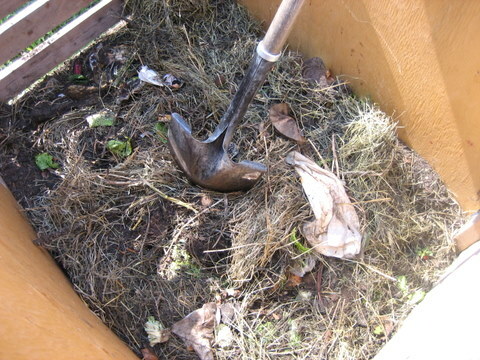 Also, once a month thoroughly turn and fluff all material in the compost bin using a shovel or pitchfork. This gets the air circulating around the material, which provides ventilation and promotes decomposition. Keeping a shovel or pitch fork handy can encourage you to mix! 3. Add some water if your compost gets dry. In the hotter summer months, add a little water every other week to keep the compost moist, but not soaking. Moisture feeds the bacteria in the compost and keeps the material composting. 4. 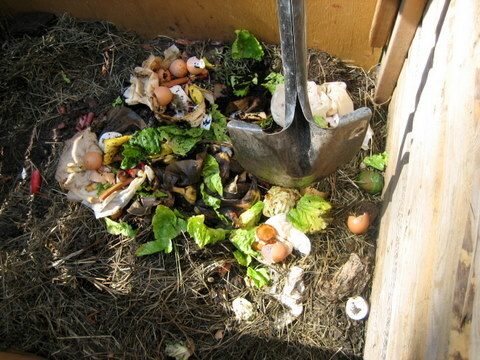 After one or two years, depending on how much compost you produce, remove most of the material from the compost bin. You can either let this sit to “finish” in a pile for a month or dig it directly into your flowerbeds and vegetable garden. Don’t fully remove all your compost, though – leaving a small amount will to help get the next batch going. TIP: Try to maintain a compost mixture of about half “browns” and half “greens”. Browns are materials high in carbon such as dried grass, leaves, sawdust, straw and paper. Greens are materials high in nitrogen and such as kitchen vegetable waste and any fresh plant material such as grass clippings. You don’t need an exact mixture, but having a compost of only browns or only greens will not promote decomposition. A working compost should not smell. If your compost has an odor and attracts flies, make sure you have a good mix of browns and greens and always cover fresh material with existing compost. With just a little effort it’s easy to reduce the amount of garbage you create while turning your scraps into fine soil for your lawn or garden. Do you compost? Would you consider it? I’m jealous! We would love to compost. Trouble is, our little urban rowhome has no yard. We do have a roof deck where we grow tomatoes and an herb garden. 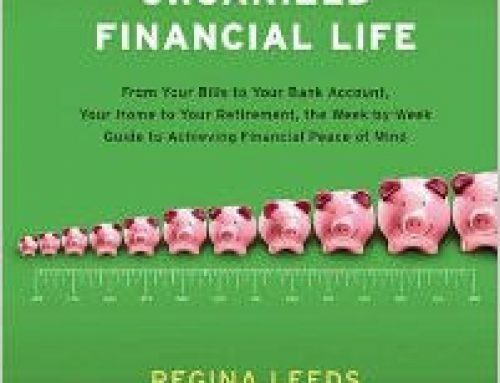 But it is tough to find composting ideas that fit our situation. There are some composters on the market that could work for us, but I hate to spend $200 plus to determine that they’re not effective – or are too stinky for the hot Washington DC summers in a small space. We always bury compost between plants in the garden. It saves a lot of work. @Abby: Several friends of ours living in apartments have had good success with worm composting (vermicomposting). Basically, you buy a special bin filled with worms that break down all of the scraps you throw in. Because the worms do most of the work instead of bacteria, smell is essentially none. Many people even keep worm bins indoors under their kitchen sinks. A worm kit with everything you need to get started should cost $50 to $100 depending on size. If you’re not dealing with yard trimmings, a smaller kit should be more than enough. Yes, we do compost. Hardest in the winter when it’s cold outside (and it seems like we put the compost bin too far away). And I’ve picked up some great idea on more things we can compost that we aren’t currently – thank you! We started composting last year. Hasn’t been overly successful – I need to pay more attention to what goes into it, moisture etc. We bought our first house last year and it came with two compost bins, so I printed a list of materials to compost from http://www.toronto.ca/compost/material.htm and started to compost. They aren’t placed well for winter use, but at least one may get moved as we get work done on the house. Rather than buy kitchen containers, I rotate between three 4L ice cream containers that I’d saved, washing them out after emptying them. There haven’t been any odor problems so far, but I can recycle them if necessary and use some of the others I have (my family does keep eating ice cream). We live in an apartment, so instead of a proper heap, we have a little mini-compost bin sitting on our balcony. It’s bascially a small 1.5-gallon (thereabouts) storage container with holes in it, elevated on two sticks of scrap wood. I top it off about once a week and use it every few weeks to make compost tea for my plants. It doesn’t stink at all. We’re new homeowners and I was thrilled to see that the previous owner had left a compost bin full of finished compost! I’ve been using it for about two months, but I don’t think it’s broken down all that much yet. This post is timely and helpful to a compost-newb like me. Thank you for posting this! I tried to compost a few years back but ended up with a slimy, smelly mess. Since we dont have a garden I haven’t tried again. In the next couple years we we buy a home we will give it a second try. I set my compost bed up last year when I put in the garden and have been using it ever since. I found that because it is up close to the house, I will use it, even in the winter storms as I don’t have to go out in the ceaseless winter rain to put my stuff in it. Seeing all the paper products tho that can go into it, I could probably make it bigger. What’s in there now is schedule to go into the bottom of the new raised bed going in soon. Thanks for sharing your ideas on a compost. We have found our composter to be very useful in that it cuts way back on garbage and also very useful come gardening/planting time. We love our composter. We compost. And when we were digging up our yard for the raised beds, every time I found an earthworm I would throw him into the composter. They looked pretty happy to me! I’m new to composting this year and I absolutely love it. My county offers composting workshops in an attempt to decrease the amount of stuff going to the landfill. For Susan – one very helpful thing I learned in the workshop was to place hardware cloth on the ground, then place the compost bin on top – that helps keep furry critters (not worms) from getting into the bin. This assumes a bin that doesn’t have a bottom of course. They also suggested putting a brick or something heavy on top to thwart entry from the top. For the scraps that are in the kitchen, I had an old Tupperware cereal container I wasn’t using and that now holds kitchen scraps for up to a week – no need to buy a specialized container. And it does not smell bad at all. The key is no animal products – closest I get to that is egg shells. Thanks Bari. That’s a good idea. I have received a few more tips should this become a problem for someone else. Apparently (1) the closer the bin is to human activity, the less likely wildlife will attempt to access it; and (2)adding more water so that the contents become more soggy makes it less appealing. It’s too bad we can’t share it with all our 4-legged neighbours, but some are less attractive than others! Good info. 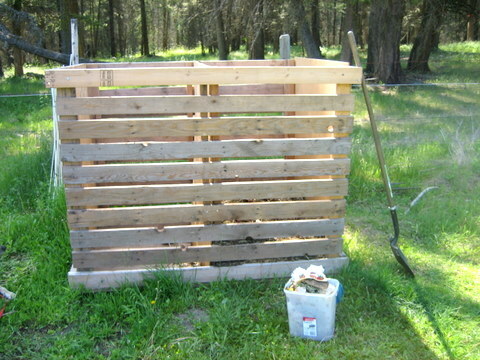 I built a two section compost crib along the lines of the one you show at the top of the blog over a decade ago. Works well to fill one side while the other side “finishes”. I put a (used) patio slab in the bottom that makes it easier to shovel out. I tried one of the tumbling composters too, which does maybe speed up the process, but I wasn’t good at remembering to give it a spin. I’ve been composting the cattle manure from the farm in a pile in the “back”. Finally spread it the other day, and was impressed at how well everything had broken down (this pile had been there for two years). (http://CedarWoodsFarm.ca/u/3 is load 1/3) Here’s hoping the hayfields respond to it. Oh, and the “curing” side is a great place to plant a pumpkin (or some other) vine! @Carl – You can build your own worm composting system for the price of a couple of bucket or rubbermaid totes <$10. 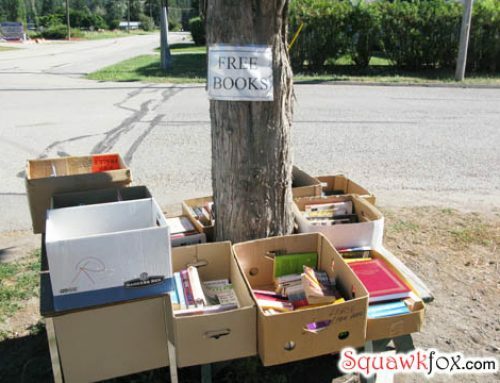 If you’re lucky, you can get the worms on freecycle. 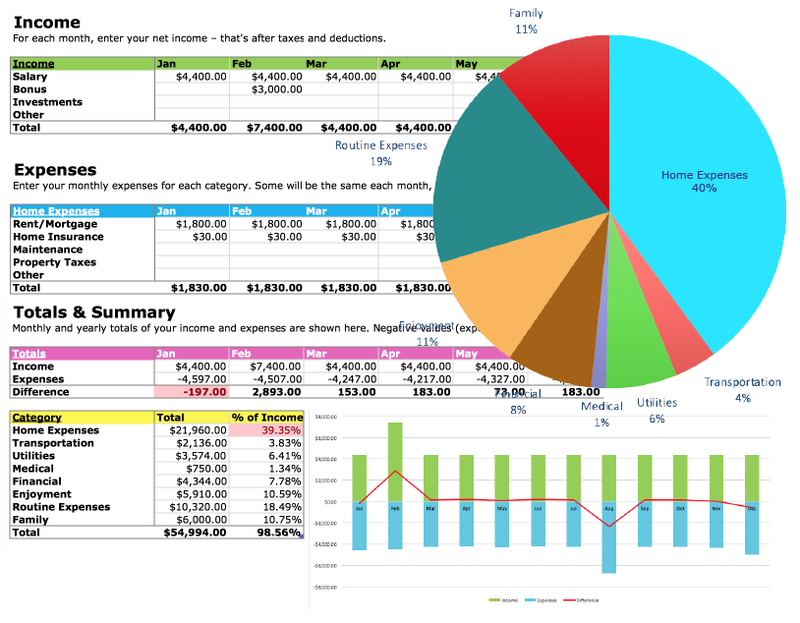 See here for how I made my system. The cycle time to break down is only a couple of months, so it takes up much less space, and the worms practically take care of themselves. We’ve got a worm composter and it works GREAT. I’ve found it very easy to use and while it optimally runs on 5 lbs of worms, we ran it half-full for the first few months with one pound of worms until our worms had reproduced enough to keep up with the scraps of the worm composter at full capacity. It works great for us since we have only a small patio to work with (no yard). It is great for houseplants. 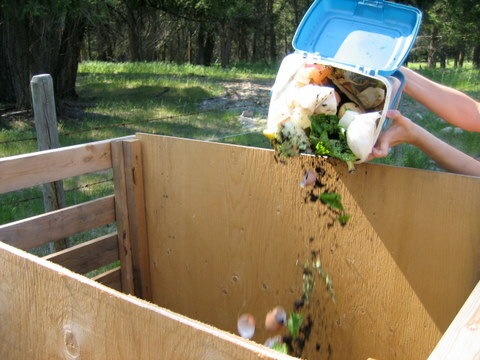 Another tip to speed up indoor or outdoor composting is to microwave your scraps first. Also, whenever I’ve boiled pasta or vegetables, I cool the water and pour that on the compost also. My houseplants and patio herb garden look better than ever this year. Instead of a kitchen compost bucket, we use the bottom drawer in our side-by-side freezer. The drawer is useless because food just gets lost in it. Using it as our compost kitchen compost bin keeps it from smelling, plus it adds water every time we empty it into our compost bin. @James – we do the freezer composting as well since we live in NYC without outdoor space. It’s a great solution and our farmer’s market graciously accepts compost drop-offs every week. I recently found out a lot of cities have communal compost dumps, so those of you without outdoor space who’d like to compost should google away. My prior attempts at composting were too slow and time consuming for me, then I started using bokashi. The pre-made bokashi mix was getting very expensive, now I make the bokashi myself and save a ton of $$ and recycle everything that comes out of the kitchen. I used to blend all my compost material then save it in an old 4L ice cream bucket out on the deck in the winter. Then I just started placing compost material in the bucket and when full, place on the deck. Go to Home Depot. Buy a (5 Liter?) Orange Bucket. This plastic is BPA-free and safe for food. Drill Holes in the lid to allow for ventilation and Voila! You now have a compost bin that is less than 10 bucks. All you need to do is turn the compost every couple weeks. Rip paper bags/newspapers and keep that on the top to reduce flies/smell. Works great for apartment living/small patio or balcony. I have to confess that we never bother mixing fresh material into the bin–in fact, we hardly even bother to turn the pile. And we have no odor problems. Once or twice in the hottest part of summer I’ve caught just a faint whiff of odor, but I just added more “browns” to the pile and that took care of it. Composting takes either effort or patience, but only one of the two. I’ve just started to compost (yay!) and noticed a fair bit of mold on the material. Am I creating a wonderful compost or a toxic mess? We had a couple of old plastic garbage cans… so I got out the old electric drill, drilled some holes in the sides, and voila! perfect for compost. And with wheels to take it where it needs to go in the garden. I live in a tropical country, with a terrible waste disposal system. Our bin is always over flowing, so I am taking matters into my own hands. Thank you for your excellent article. Other pages I’ve visited don’t give options, they just assume people have access to a tumbler. I hope composting works as well for me as it did for you. Thanks again! Hello everyone, my neighbor just installed a fairly large composting system approx 10 ft away from the property line and close to our swimming pool. The smell is horrible, there are a lot of small flies and we even saw a rat the other day come out of it. Do any of you have Amy thoughts on how I should approach this problem? Are there any good practices for installing and maintains these things – i think if you put one in you should be considerate of your neighbors.